Paris is beautiful. Bring that beauty for your event. 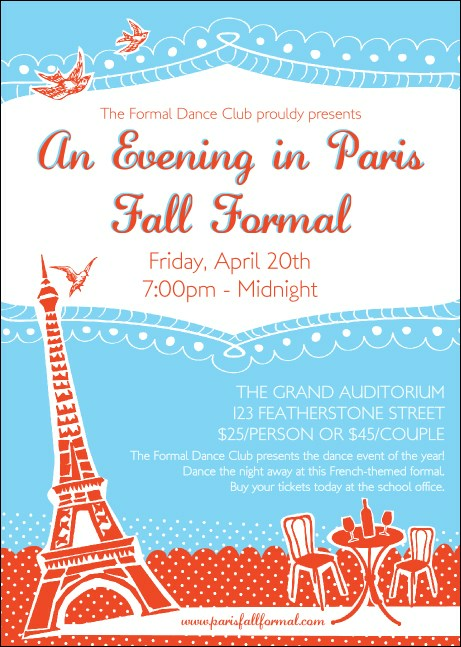 Printed in white, red, and blue, the Whimsical Paris Club Flyer. Filled with iconic images that will evoke images of the City of Light, when your guests receive this club flyer, they'll say "Ooh, la, la!" Birds, the Eiffel Tower and Cafe Tables provide the perfect background for the message you want to share. TicketPrinting.com has matching event kits for your themed party.